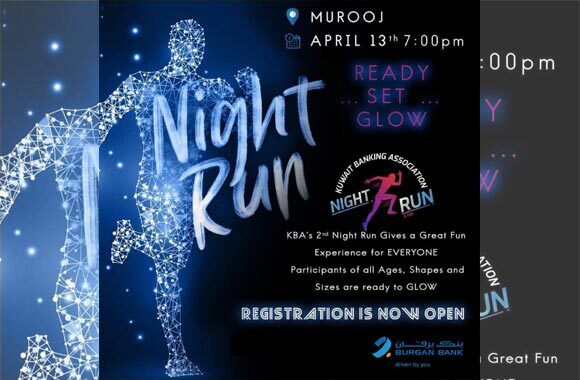 Kuwait – 6 April, 2019: Held under the umbrella of the Kuwait Banking Association, Burgan Bank, one of the leading contributors to sustainability and progress in the Kuwaiti community, is sponsoring the 5 KM “KBA Night Run” for the 2nd time in a row scheduled to take place on April 13, 2019 at 7 pm at Murooj complex. As part of Burgan Bank’s ongoing commitment to encourage sports as a gateway to maintaining a healthier lifestyle, the bank encourages the participation of all families, athletes and avid runners to sign up for the much anticipated marathon. Running under the theme of ‘Ready, Set, Glow ‘, the 5 KM run is a one of a kind event as it takes place at night accommodated by particular gear to glow in the dark, targeting both genders of all age groups at any level of fitness. The event is aimed at enabling both adults and youth explore sports and fitness as a means to leading healthier mind-sets and overall lifestyle. In participation with other banks in Kuwait, Burgan Bank’s contribution rests as part of its corporate social responsibility towards supporting all genres of people with significant emphasis on youth empowerment and athletes’ passion for running while facilitating lasting positive change on an individual and collective front. Marathons encompass several areas of challenges that result in therapeutic benefits ranging from physical, mental and emotional developments. Participants are required to train and equip themselves with a holistic approach that involves nutritious food, mental focus, stamina, strength and endurance in order to enhance performance. Backed by the belief that better choices make for better lives in the long run, such recreational activities engage the mind and body to unite with other likeminded individuals on the same road to achieving a common goal of personal enrichment and happiness. As a determined advocate of societal advancement and wellbeing through innovative health initiatives, Burgan Bank had previously sponsored and hosted similar nationwide sporting events namely the Burgan Bank Tri Festival, a successful celebration of sports, healthy lifestyles, fitness and fun as well as the Spark Marathon, Kuwait's biggest charity race. Burgan Bank's support of this initiative falls under its dynamic full-fledged community program entitled ‘ENGAGE’ – Together to be the change. This program sheds light on important aspects affecting every segment of the society by promoting social welfare through educational, cultural and health driven initiatives. Burgan Bank’s approach to 'ENGAGE' begins with a vital principle that as a leading Kuwaiti financial institution, its conduct and policies should be aligned with the needs and interests of the community.